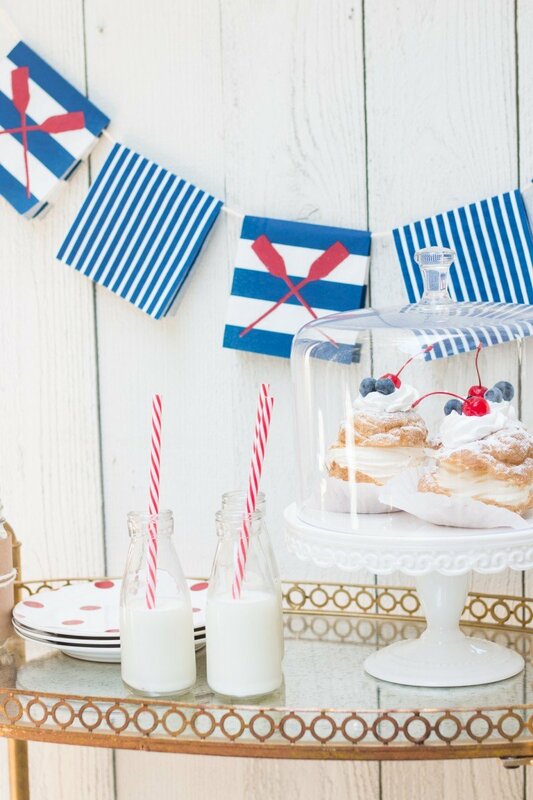 With Memorial Day just around the corner, I thought it would be fun to share a few of my go-to tips for throwing a simple party. I have always said that creativity does not need to take a lot of time or break the bank. Just the other day some girlfriends and I threw together a super simple cocktail evening and we planned the color scheme based on cocktail napkins we had on hand. The cocktail banner is one of my go-to tricks when hosting. It takes less than five minutes, is inexpensive and makes a big impact. 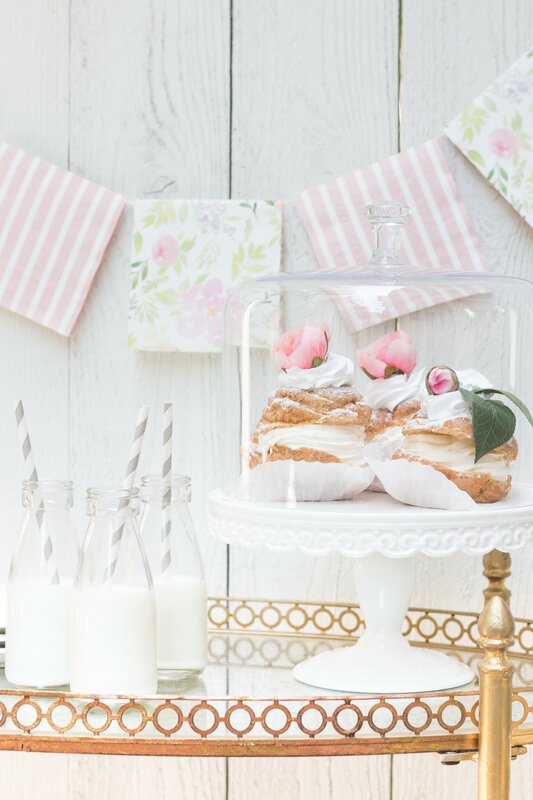 Here are five easy party decor tips for making an event look pulled together. 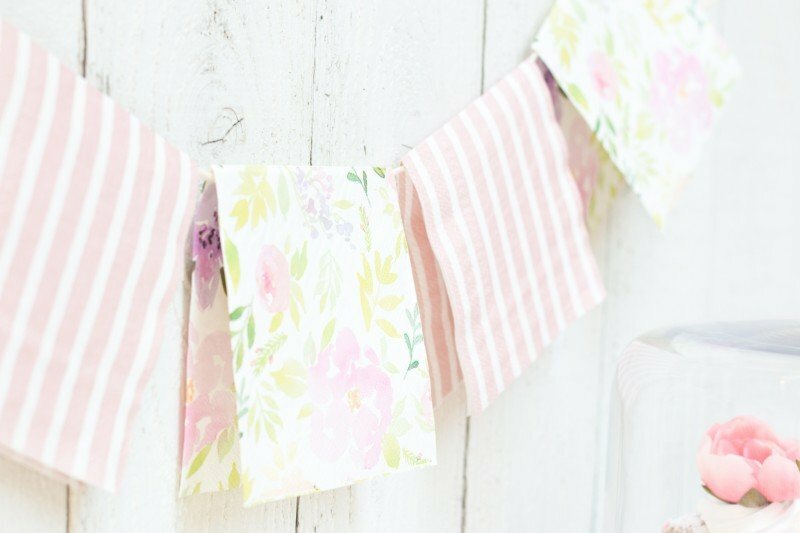 I created my first cocktail banner years ago out of desperation for something to hang and define a party space. I must admit I love a great cocktail napkin and always seem to pick up a pack when I see cute ones. It’s such an inexpensive way to add color and pattern. 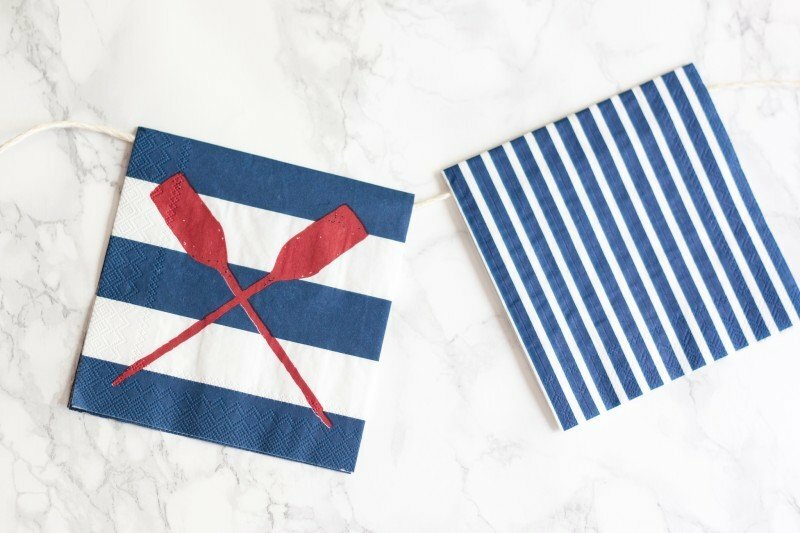 When picking up cute napkins try to avoid the ones that have a funky border on just two sides. You’ll see what I mean when you start looking. That border throws off the symmetry when they are hanging. Try to vary the size of the pattern. So if you go with a large stripe, then add a small stripe or a polka dot. 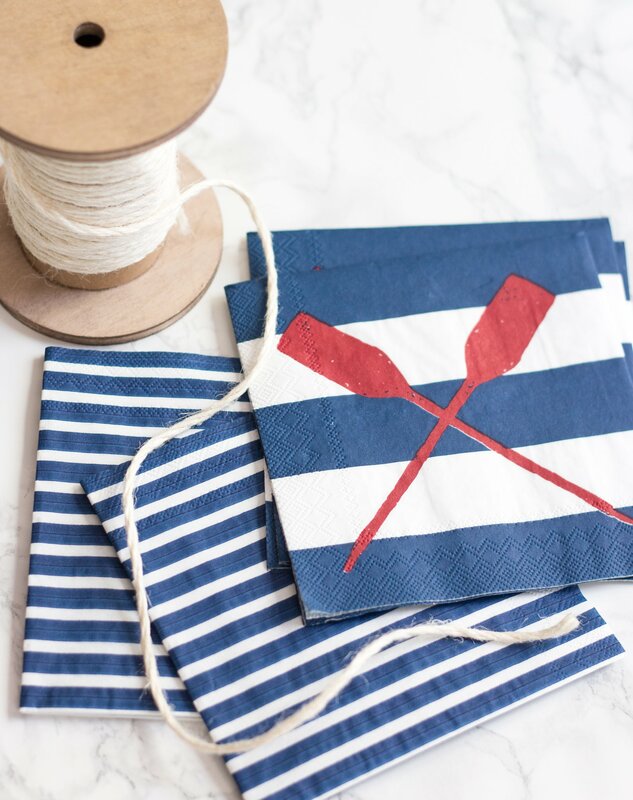 It’s easy when one set of napkins has an extra design on it like these oars. Then you just need to add one more pattern. You know why I love this so much? You don’t even need to cut anything! (Well just one length of string). It’s that simple. You fold the napkin over the string and you are done. If it’s not a windy day or your party is inside, simply let them hang over the string. Then you can even reuse the napkins. If it is outdoors and your are worried about a breeze, just tape the napkin together on the inside with double-sided tape. No one will ever see it. After choosing your napkins, go with that color scheme. Mix and match whatever you have to make it work. 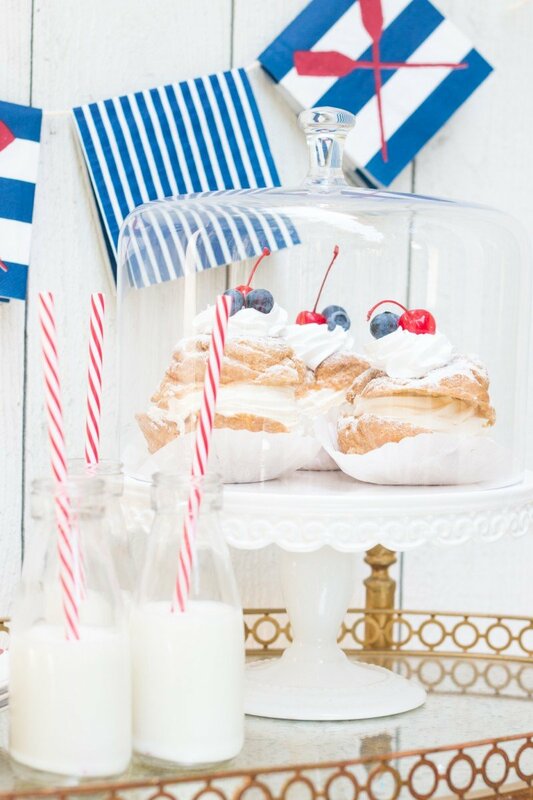 Here I made sure the pastries had some red, white and blue. 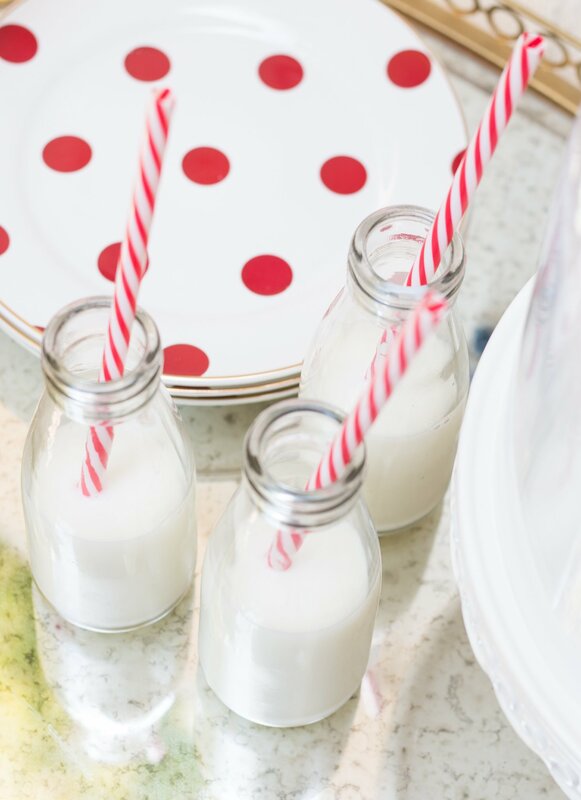 I grabbed the red straws and printed dishes to tie it all together. 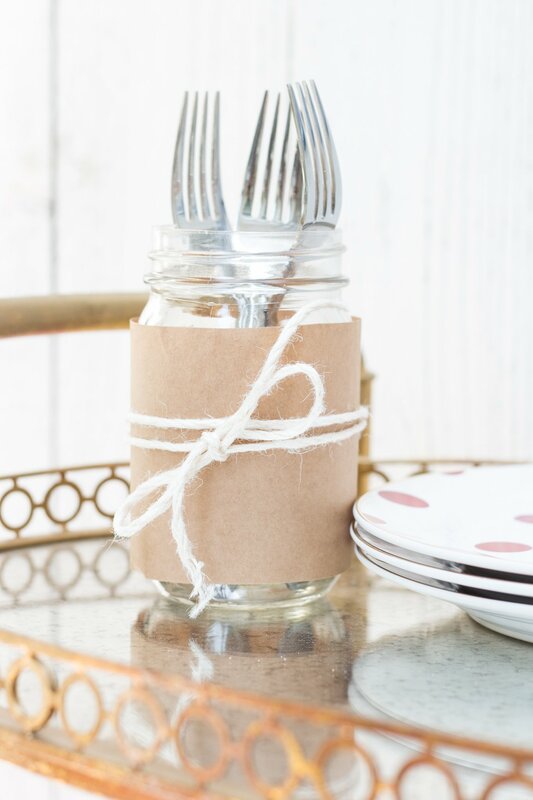 Don’t forget you can use strips of napkins to wrap around vases or mason jars, too. 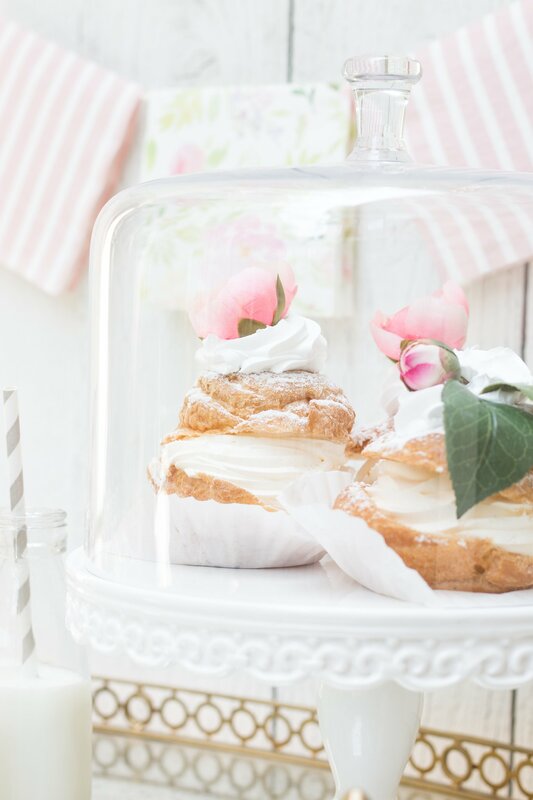 If you have been reading my blog for a while, you know I am not much of a baker. Just not my thing. I think the closest I get is making the annual back to school rainbow cake each year. Which, uh hem, is from a box. So I am all for the store-bought goodies from your local grocery store or bakery. Then customize them to fit the party. These actually came with pretty chocolate fretwork on top but I removed them so my fruit could carry the color scheme. No matter how small your setup is, mixing patterns takes it to a new level. You see that here. This is a really small dessert area but it works because of the patterns. 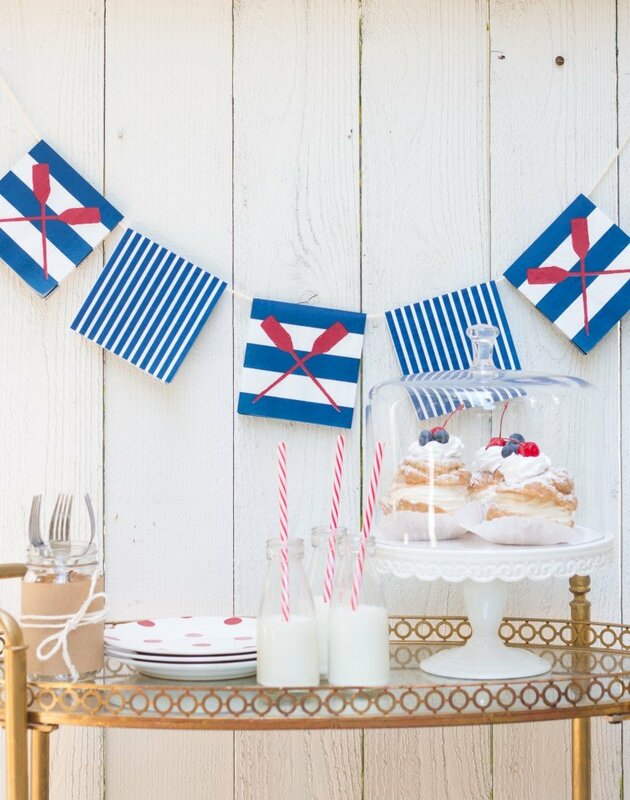 You have not only the banner but then the polka dot dishes and striped straws. Don’t be afraid to go big with pattern mixing. Just keep it all within the same color scheme. Add some wrapping paper or brown paper to a mason jar and tie it off. It takes one minute to do but it looks so much more intentional. It’s those little details that make people feel even more welcome and special. And sure is cuter than tossing forks on a plate. I wanted to show you that you can do this with any combination. Look how sweet this setup looks just by changing the colors. 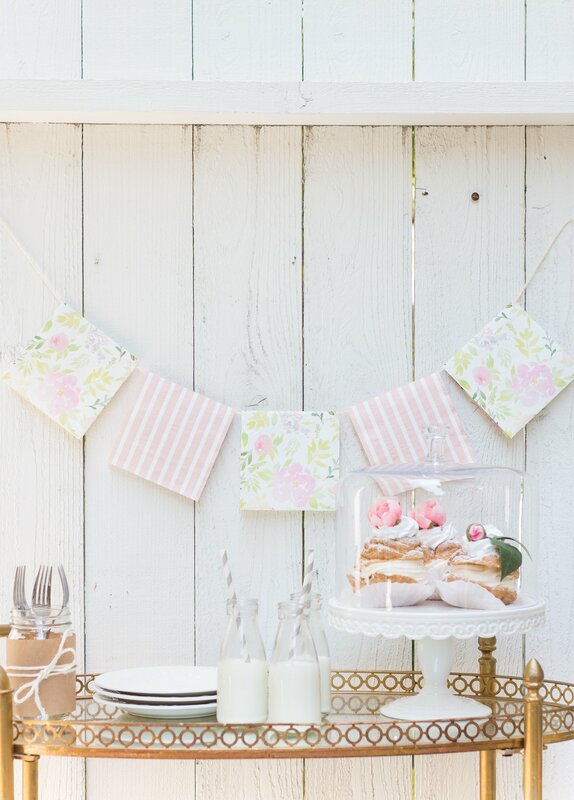 This soft cocktail napkin banner creates a more feminine and soft look. Then you just roll with it. With this setup I kept things more white and neutral because I liked the quiet vibe this had. Varying the heights of things is also always key. That adds dimension to your table. And if you have a bar cart don’t be afraid to pull it outdoors. Or look for a little side table that you may be using as a nightstand. When I entertain I shop the house. I didn’t buy anything except for goodies and two sets of napkins. That’s what I’m talking about! (How we normally use our bar cart here). 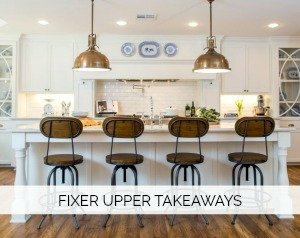 Hope these tips make entertaining not only simple but enjoyable, too. And if you end up hanging a cocktail napkin banner this weekend in honor of Memorial Day let me know! I would love to feature a photo on Instagram of a great party setup. 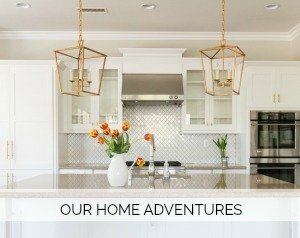 See all of my past parties here under Gatherings! Off to meal plan and grocery shop. Apparently my family needs to eat this week. Which brings me to a funny story. The other day my son opened the refrigerator (after our birthday bonanza week) and said, “Mom. You really need to go to the store. We only have birthday cake and apples.” But I was like, “Um. Why do I need to go the store. We have birthday cake and apples!” All about perspective I suppose. This is such a fun set up for a party Courtney! I love the simplicity of the banner using the cocktail napkins. Very clever! 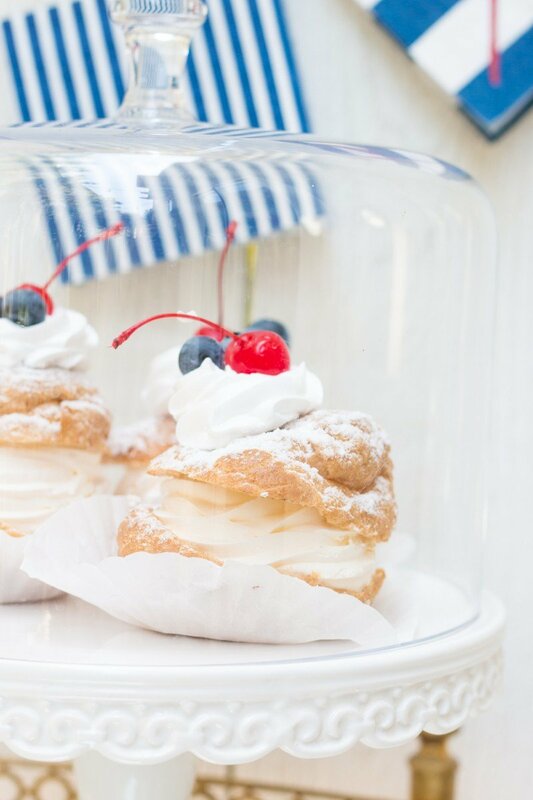 I went to bed lat night dreaming of cream puffs after I saw your IG photo. I always love your simple party tips, Courtney! 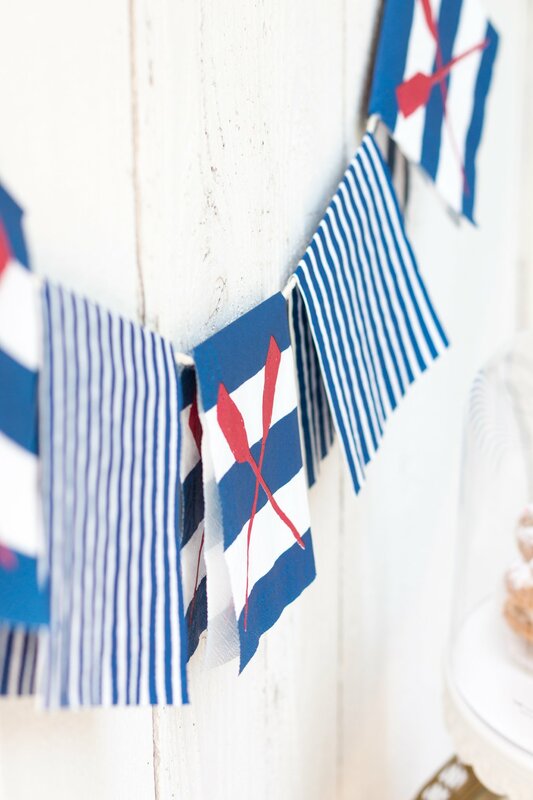 Obsessed with this napkin banner! I will definitely be trying this next time I throw a party! The banner idea is so clever. I love it. I would’ve never thought of that. I will definitely add that to my bag of tricks. I love, love the napkin banner. How clever of you! Thanks, Patrice!!! Always love your sweetness. Happy Memorial Day weekend!